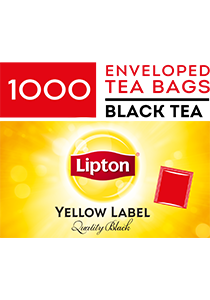 Discover the flavor of LIPTON Yellow Label Quality Black Tea made with sun-ripened tea leaves. Get energized any time of day with a cuppa of 100% sustainably sourced tea leaves from Rainforest Alliance Certified Farms. LIPTON also offers a full range of Black & Green Tea and Fruit & Herbal Infusions. Tea time is the most important time of their day. LIPTON will keep your residents happy every tea time. Recharge anytime of day with a good cuppa. Filled to the brim with awakening taste, start your morning with a hot drink of LIPTON Yellow Label Quality Black Tea Bags. A sunny sip to awaken you to the wonders that the world has to offer. That's what we mean by live awake. Our Master Blenders have crafted a delicious blend that includes carefully selected and fresh-pressed tea leaves, capturing as much natural quality taste as possible. We believe Tea makers lives matter. They make a big difference and that is why we are in partnership with Rainforest Alliance. Together we've already trained over 500,000 farmers in Kenya. We are committed to helping our team of farmers create a better life for themselves, their families and their communities. Infuse 1 tea bag in 200mL of boiling water for 2- 3 minutes. Weight - 1.8 kg. Weight per serving/portion - 1.8 g.